Fox Searchlight x Mr. Will want to give Readers in Toronto, Vancouver and Calgary a chance to attend an Advance Screening of TABLE 19! Screenings take place on Monday, February 27, 2017. 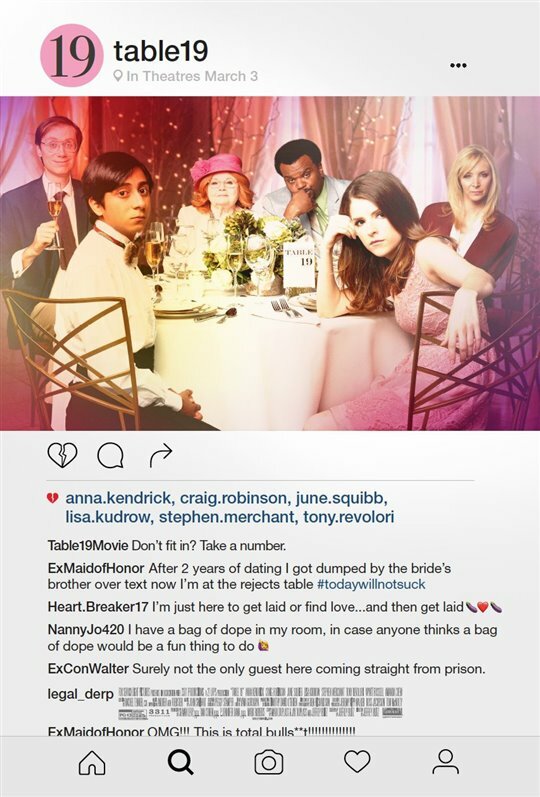 Ex-maid of honor Eloise (Anna Kendrick) – having been relieved of her duties after being unceremoniously dumped by the best man via text – decides to hold her head up high and attend her oldest friend’s wedding anyway. She finds herself seated at the ‘random’ table in the back of the ballroom with a disparate group of strangers, most of whom should have known to just send regrets (but not before sending something nice off the registry). To enter, simply click “like” on this Post at Mr. Will on Facebook and indicate your City. For an extra chance, “favourite” this Tweet on Twitter: @mrwillw. Fox Searchlight release TABLE 19 on Friday, March 3, 2017.